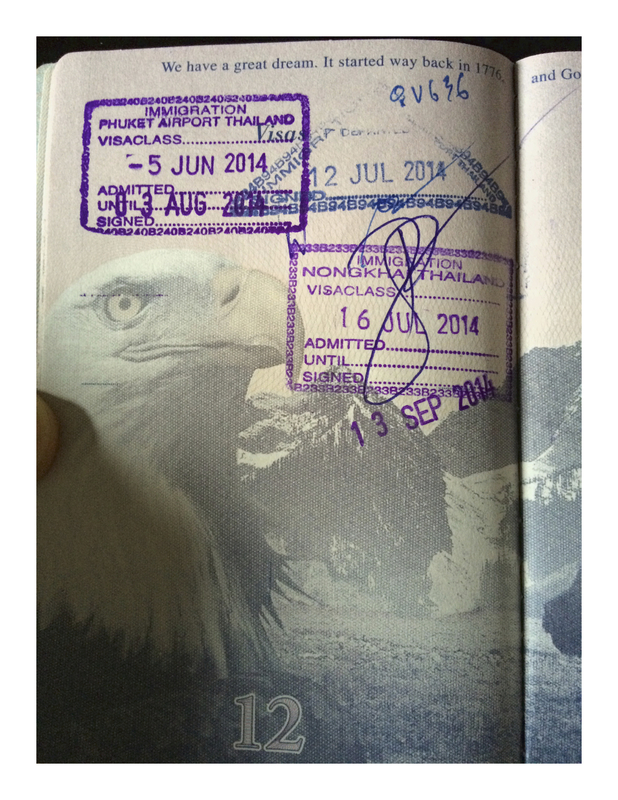 Alexis and I entered Thailand on triple-entry tourist visas. She has since switched to a Non-Immigrant Visa “B” Visa, commonly referred to a work visa, but I am still on my tourist visa. With a tourist visa, for every entry and re-entry into Thailand, you are granted 60 days, but have the option to extend that another 30 days. I did not choose to do so on my first entry (when we first arrived in Thailand) but now on my second entry after we returned from our trip to Laos, I wanted to apply for a 30-day extension. We’re going on a trip to Malaysia, Indonesia, and Southern Thailand next month so the timing actually worked out perfectly that if I got a 30-day extension from the date my second entry expired (September 13th), I could stay in Thailand until October 13th, which is three days after Alexis’ school lets out for break. 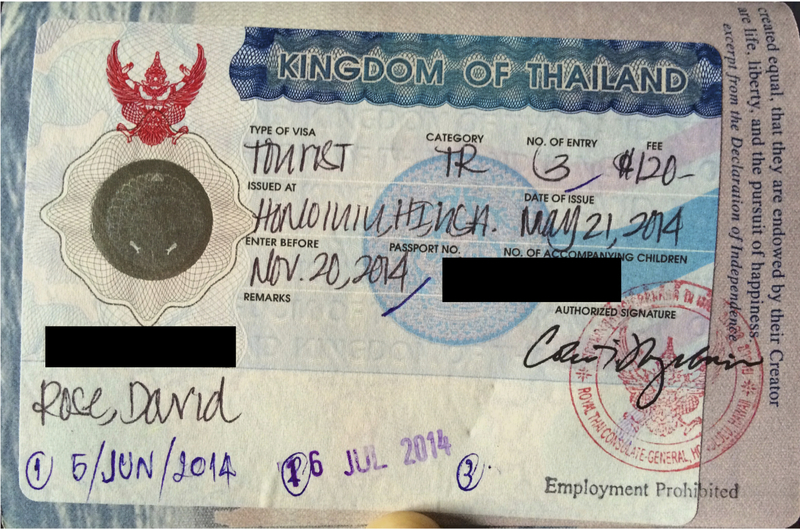 My triple-entry tourist visa. “TR” is the official labeling of this type of visa. 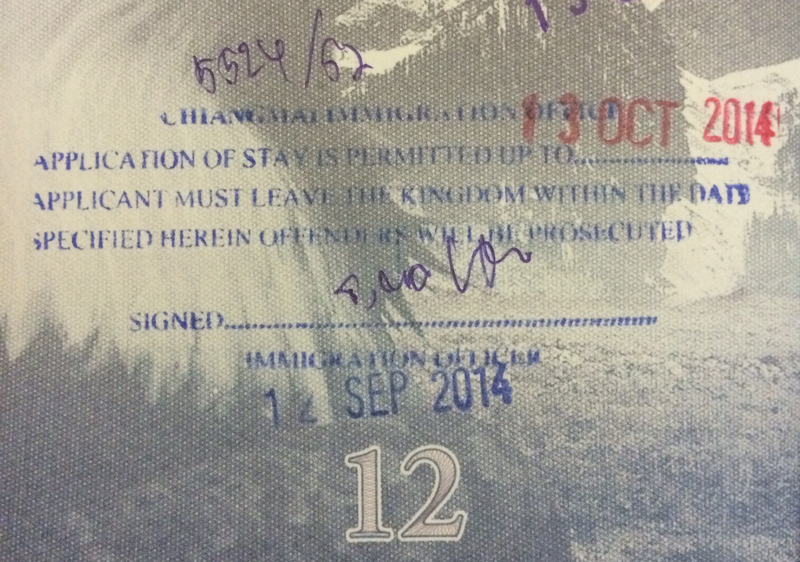 You can see how the border agents are using the space on the bottom to note each date I entered Thailand. 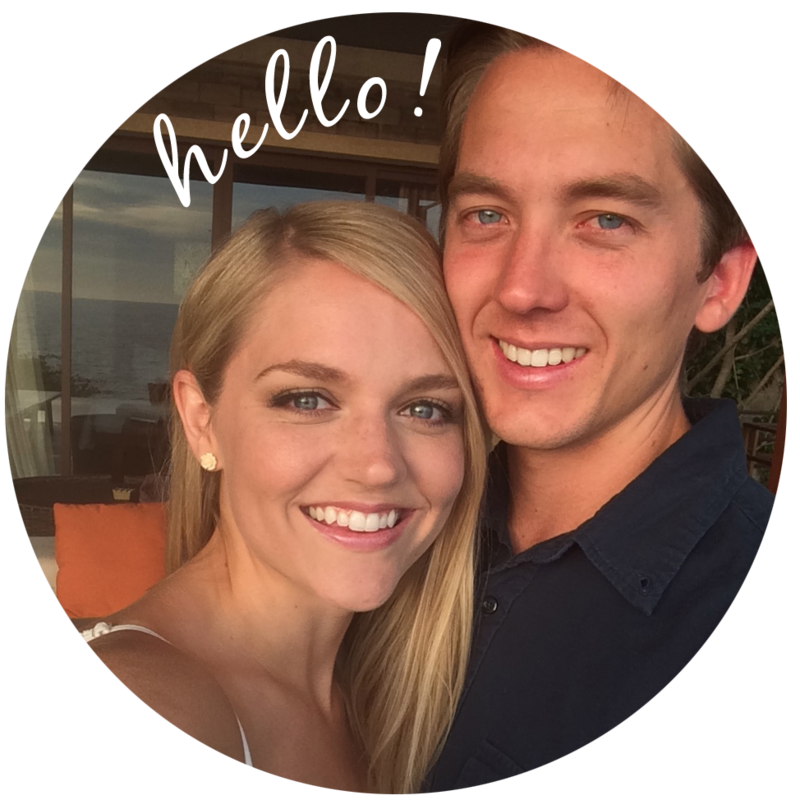 June 5, 2014 was the date we arrived for our honeymoon and July 16, 2014 was when we got back from Laos. I have one more entry left which I have to use before the “Enter Before” date of November 20, 2014. Alexis’ school starts back up on November 3rd anyways, so that won’t be a problem. The stamps the border agents put in your passport every time you enter the country further explain how the process works: When we entered on June 5th, we had to leave by August 3rd (60 days), and when we re-entered on July 16th, I had to leave by September 13th (again, 60 days) OR apply for a 30 day extension, which is what I just did this past Friday. Even though you can apply for your extension on the last possible day (meaning the 13th in my case), the 13th was a Saturday and the immigration office in Chiang Mai is not open on the weekends, so I had to go on Friday, the 12th. I used this post from The Way of Slow Travel as my guide. All in all, it was a very thorough guide and told me everything I needed to know. There are just a few differing or additional points of clarification I can provide on his otherwise perfect guide. This is not how it worked when I went. I arrived right at 8:30am when they opened, walked up the counter, told the woman I wanted to extend my visa and she gave me a number. I waited until this number was called and that was it. It appears as if they have done away with the first number he describes: the pre-queue blue laminated number. 2. Daniel links to a MS Word version of the Thai visa extension request form (TM. 7) that you need to fill out. I would suggest downloading the PDF version instead as the Thai characters on the form didn’t show up in Word, but they did on the PDF. Download the PDF version here. 3. Daniel has a section called “Photocopies” in his guide. He’s spot on with every single document, that’s exactly what you need. The only thing I would add is that the office workers at the immigration office will ask you to sign every photocopy page. One of the photocopies you’ll need is your departure card which you should have been given upon arriving in Thailand. This also has the same stamp of the date you arrived and the date you need to leave by. 4. With respect to how long the whole process takes, Daniel said: “If you want to beat the crowds, you’ll want to get there by 8:00 am at the latest. Arriving at 8:15 am will guarantee you at least two hours of waiting.” I didn’t arrive until 8:30am, but was out of there in an hour and 20 minutes. From the time I got my number until they called that number, it was 50 minutes. I went up the counter, handed them my passport, all my paperwork, and 2,000 baht to cover the 1,900 baht fee, and then waited another 30 minutes until they handed everything back to me. I believe him though that it could take much longer and consider my situation fortunate. The wait wasn’t that bad at all. 5. When I said, “they handed everything back to me” that’s not entirely true as one thing Daniel mentioned could happen, did happen. He says: “you’ll be called to the front again, and you’ll get your passport, your change, and a receipt. (Check that you have your change, as some report that they had to ask for it. )” I report that. I had to ask for my change. They all spoke good English, but the two girls looked confused. They went and talked to some guy in the back for a bit, riffled through a bunch of paperwork, but eventually came back with my 100 baht change. The building where you need to go is behind the parking lot, not the one right on the street. If you’re driving then this won’t be an issue, you’ll see the signs right away when you park. But I took a songthaew which let me out on the street. The first building you see when you walk into the gated area is not where they extend visas, that would be the building on the other side of the parking pot. The woman in the front office was really nice and directed me to where I needed to go, so don’t worry if you make the same mistake I did. There is wifi in the building, but I don’t know if they give the password out to non-employees. Just thought this might be something to note for people like me who don’t have a Thai cellphone and rely on wifi to text or make calls. I didn’t ask for the password, but it would have made passing the time while I waited much easier. It appears as if they started my 30-day extension from my last day allowed on my current entry (September 13th) rather than the day I actually got the extension (September 12th). My shiny new extension stamp with my new departure date of October 13, 2014. Overall, the process was very smooth. I was granted my 30-day extension with no problems and everyone at the immigration office was very nice and helpful. Any questions? Don’t hesitate to ask! Enjoy your stay in Thailand! Your post was SO helpful. It was exactly what I was looking for! Glad my updates could be of help. Thanks a bunch for sharing this with all people you really understand what you are speaking approximately!